My taste-buds only started becoming accustomed to eggplant in recent years. Ever since people have raved about my roasted eggplant dip recipe, I have been using eggplant more often. Fortunately for me, eggplant is popular where I live. Very few people I know will fret over eggplant. Otherwise, it has been served at every table I have eaten at. If you are looking for an easy side idea and are an eggplant lover, this recipe was intended for you. First I sliced and roasted the eggplant. Then I marinated it with balsamic vinegar and lemon juice. A bit of garlic and a few chile flakes give it plenty of flavor, making it perfect for serving alongside salads or simply spreading on crispy toasts or fresh baguette. I made marinated eggplant for a host I was eating by. Since eggplant is slowly becoming popular in the Anglo community, I was hoping there would be leftovers for me to take back and eat them with an omelet. It never happened. Preheat oven to 400 degrees F. Lay eggplant slices and pepper slices on a baking sheet. Drizzle with a bit of olive oil and season with salt and ground pepper. Roast for 30 minutes or until eggplant is tender. Once cooled, place eggplant, peppers, and tomatoes in a container. Add the remaining ingredients. Cover and let it marinate for 30 minutes. Serve chilled or at room temperature. This entry was posted in Gluten Free, Side Dishes, Vegetarian and tagged eggplant recipes, marinated eggplant, side dish ideas. After boasting the success of this sweet and sour Asian roast, I promised to share a recipe. However, I am trying to fight the habit of making one-pot meals (I fail to see the problem in that) and owning a slow-cooker is making it difficult for me to resist the temptation. I was expecting company at that time and did not feel like washing a lot of baking dishes and trays. A slow cook Asian roast was a viable solution for me especially when I had to tend to more pressing matters. 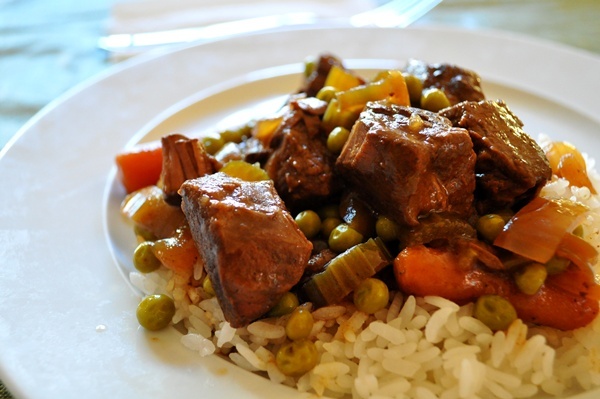 The weather is slowly starting to get nippy and I was in the mood for stew and less hassle. Great for entertaining large groups of people, try this no-fuss slow-cooker recipe with an infusion of vibrant Asian flavors. This delicious sweet and sour Asian roast was cooked in a slow-cooker which was a time-saver and a stress-reliever for me. I used a cheaper cut of meat to make this Asian roast a economical and delectable meal. You can use a lean cut of beef such as flank steak, eye of round roast, or moose/bison roast. Serve this Asian roast over a bed of brown rice or rice noodles. Brown beef in a a greased skillet. Transfer to a slow-cooker. In a large bowl, combine all the ingredients together. Pour over beef in the slow-cooker. Cover and cook on low for 8-10 hours or until beef is tender. Serve hot with steamed rice. This entry was posted in Meat and tagged Asian flavors, Asian Roast, dinner ideas, meat recipes, sweet and sour. Despite what rumors some may have you believe, it is a verified fact that quinoa is not a grain of any kind. It is in fact a a seed of the Chenopodium, or Goosefoot plant, but is used as a grain when cooking. Packed with protein, quinoa contains every amino acid, and is particularly rich in lysine, which promotes healthy tissue growth throughout the body. It is also a good source of iron, magnesium, vitamin E, potassium, and fiber. Quinoa has been finding its way in the spotlight and is appearing in more restaurant menus and recipe sites. Gluten-free and light, quinoa is versatile and can be served in many different ways with any ingredients of your choice. Plus, its mild taste and rich texture make it perfect for different kinds of dishes. 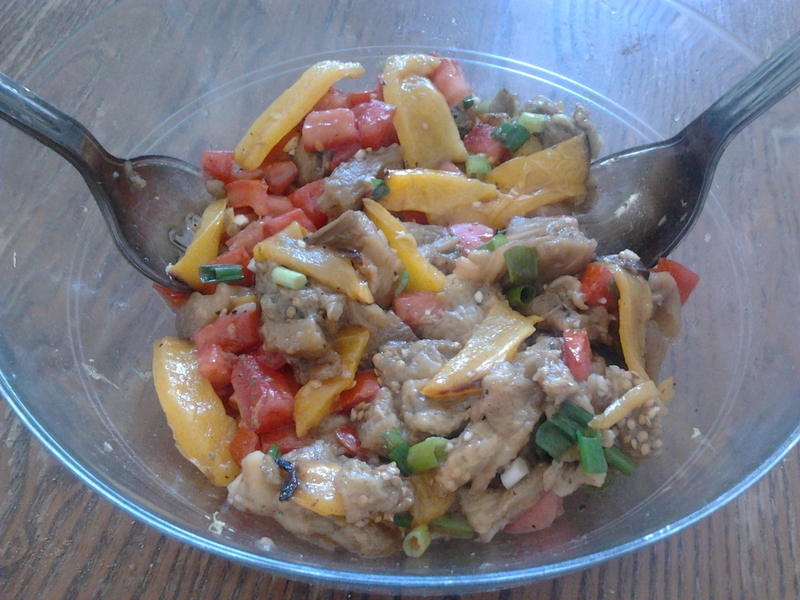 Quinoa is most popularly served as a side dish although I have made various quinoa salads on several occasions. If you are looking to spice up your quinoa side dish with Middle Eastern flavors, I have the perfect quinoa recipe for you. I actually borrowed this recipe from a risotto recipe using quinoa instead of risotto for a lighter rendition. I also incorporated cubed squash for a semblance of Fall but pumpkin works just as well. Dried cranberries and pine nuts were used as garnish on this side dish which gives it a festive appearance. You can always omit these two ingredients if you don’t like them. Walnuts are also a cheaper alternative to pine nuts. Toasting quinoa gives it a slightly nutty taste and complements the walnut flavor (if using any). This versatile side dish pairs well with chicken, beef, or fish. Toast quinoa in a large dry skillet over medium heat, stirring often, until it crackles and becomes aromatic, 3 to 5 minutes. Transfer to a fine sieve and rinse thoroughly. Heat oil in a large saucepan over medium heat. Add leek and cook, stirring often, until softened, 2 to 3 minutes. Add squash and cook for another 7 minutes or so. Add chile pepper and garlic; cook, stirring, for 30 seconds. Season with ground pepper and spices.r Add the quinoa and broth; bring to a simmer. Reduce heat to maintain a gentle simmer, cover and cook until the quinoa is tender and most of the liquid has been absorbed, 20 to 25 minutes. 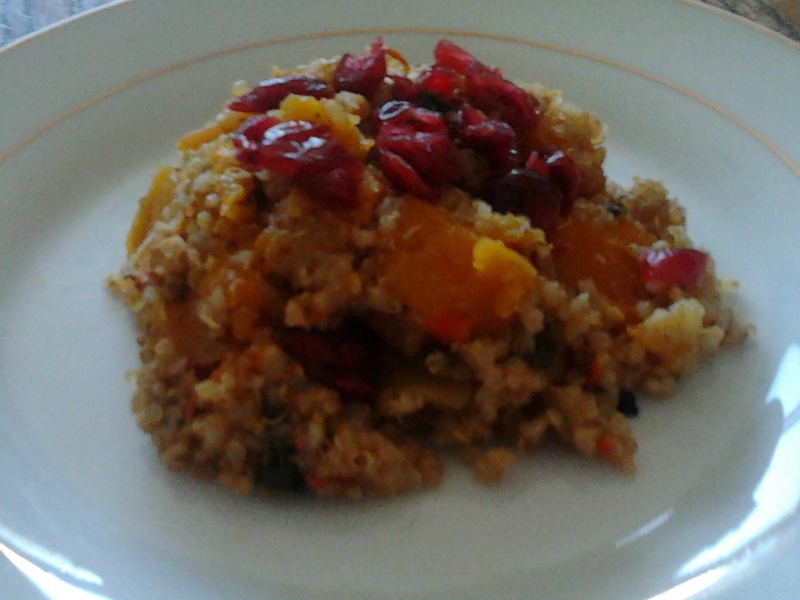 Add mint leaves, lemon juice, dried cranberries, and nuts to the quinoa. Mix gently and fluff with a fork. This entry was posted in Gluten Free, Side Dishes, Vegetarian and tagged Middle Eastern flavors, quinoa recipes, royal quinoa, side dish ideas. I practically live, breathe, and eat oatmeal. So does Hubby for that matter. As a matter of fact, he got me hooked on oatmeal. Up till now, I would have preferred cold cereal. Not only are oats thought to lower your cholesterol level but it keeps you fueled for a couple of hours therefore stalling your temptations for compulsive snacking (a habit that I am trying to curb). Understandably, eat oatmeal for breakfast on a daily basis can tire pretty quickly. I don’t always have the time or the energy to whip up a batch of oat pancakes or bake oat muffins. Cookies and cakes won’t cut it either. I vividly remember my mother scolding at me for eating cakes, cookies, and doughnuts for breakfast. In my defense, sometimes I am in a rush and need something on the go and I don’t have time to wait around for my oats to cook. I know. You don’t need to lecture me. I got plenty of those growing up (and still do). Laziness is never an excuse. I should learn to budget my time more wisely and put in more effort into implementing nutritious breakfast ideas. I have a oatmeal cake recipe that my mother (and hopefully most moms) will approve of. Made of rolled oats, chocolate chips, vanilla extract, milk of your choice, and oat flour, eating this oatmeal cake is like eating a warm chocolate chip cookie, with gooey, melted chocolate in every delicious bite! Better yet, there are neither eggs nor gluten making this oatmeal cake recipe gluten-free and vegan friendly. Serve these individual cakes hot with low-fat whipped cream or yogurt. Preheat oven to 350 degrees F. Whisk the first 5 ingredients in a bowl. Combine the wet ingredients and mix in with the dry ingredients. Grease 2 ramekin cups. Distribute batter evenly in ramekins. Bake for 20-25 minutes, or until firm. This entry was posted in Breakfast, Gluten Free, Vegetarian and tagged breakfast ideas, oatmeal cake recipes, oatmeal cakes, oats, rolled oats. If you already don’t know by now, chocolate mousse is one of my favorite chocolate desserts. I always call first and last dips on chocolate mousse every time it’s served. 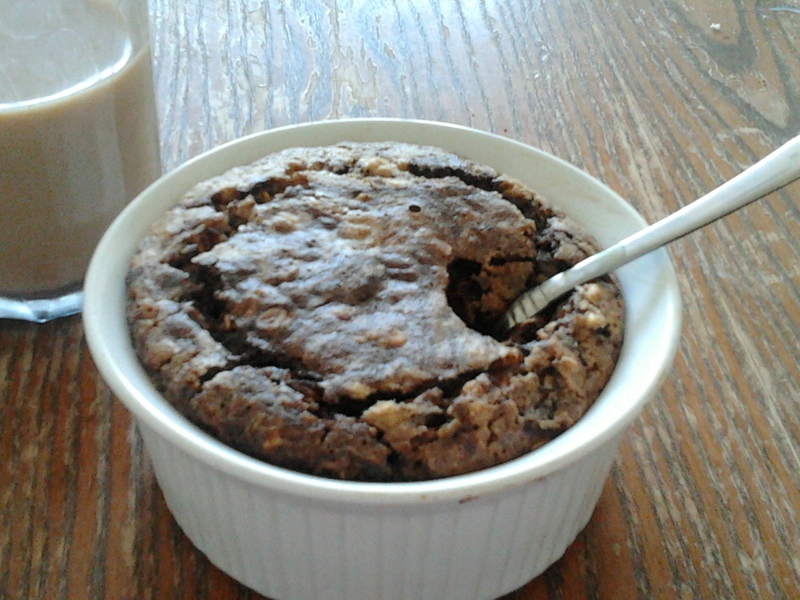 I actually intended to make a no-bake chocolate hazelnut tart but the filling didn’t solidify to the way I wanted it to. 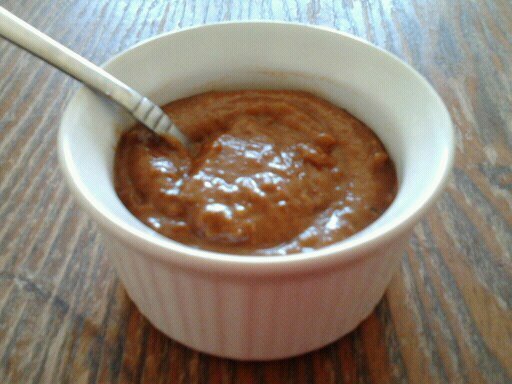 I’ve tried numerous ways to make chocolate mousse that is low-fat, vegan, and soy-free. And I found a way. This raw chocolate mousse recipe guarantees the airy but dense texture as in a regular chocolate mousse but without eggs and cream. It is also very easy to make, especially if you are in a rush, and it’s not as technical. Plus you can enjoy a dessert such as this recreated chocolate mousse without the guilt. While I used hazelnuts for this vegan and soy-free chocolate mousse recipe, macadamia nuts would work as well if you don’t like hazelnuts. They do need to be soaked for a couple of hours before use. Because this is such a small recipe, it whips up best when made in a food processor. Fresh berries add fun and extra flavor to your mousse! Melt chocolate chips with oil and stir. Set aside to cool for a few minutes. Place the rest of the ingredients in a food processor. Process until extremely smooth. Drizzle melted chocolate as processing. Spoon mousse into individual dishes and refrigerate for at least 2 hours before serving. Serve with fresh berries of your choice. This entry was posted in Desserts, Gluten Free, Vegetarian and tagged chocolate desserts, chocolate mousse, raw chocolate mousse recipe, vegan and soy-free. Turkey burgers have invariably received negative feedback when eaten at events. People normally complain that they are bland and too dry therefore preferring beef burgers. Even though I enjoy a good juicy beef burger, a change of pace from time to time is appreciated. A tasty and juicy turkey burger may seem nearly impossible for some to achieve but allow me to assure you that it isn’t. The ingredients aren’t just limited to ground turkey, eggs, salt, and pepper. You can jazz up your turkey burgers up with any condiments of your choice such as BBQ sauce, chili sauce, soy sauce, teriyaki sauce, or salad dressings. I used a bit of pesto and sun-dried tomato dip. Since sun-dried tomato dip contains high sodium content, I do not recommend that you add more salt. Not only did I get a moist turkey burger but a flavorful one at that. I served 18 of those turkey burgers over the weekend. My only concern was that my guests wouldn’t leave any left for hubby and me. My prayers were answered and they were considerate enough to leave us with 2 patties :-). Portion control is also an integral part of losing weight. I suppose that a party platter perpetuates overeating. 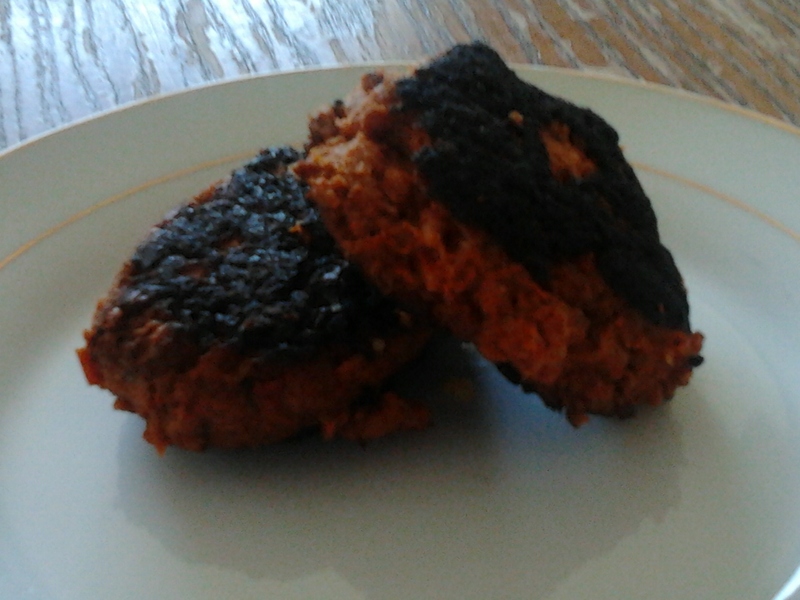 I learned two things from this turkey burger recipe: 1) Turkey burgers need no longer to be a stigma. 2) Triple the batch when having company over, even if it’s a small number of guests. If you are worried about having leftovers, you can stop fretting because there is a probability that there won’t be any. Combine all ingredients in a bowl and mix well till all ingredients are incorporated. Cover and refrigerate for an hour. Preheat grill to high. Form mixture into 8-10 patties. Brush each burger with oil. Grill the burgers until cooked through and no longer pink in the center, 3 to 4 minutes per side. Toast buns on the grill, if desired. This entry was posted in Gluten Free, Meat and tagged Ground turkey, sun-dried tomato dip, Turkey Burger recipes, turkey burgers. Some of you may be scratching your heads wondering why a caramel sauce recipe is featured on my website considering that most of my recipes are health oriented whereas caramel sauce is not. I love caramel sauce. Made of sugar, butter, and heavy cream, you expect my website to be the last place to publish a caramel sauce recipe. Well, think again. You won’t need to scratch your scalp raw any further once I divulge a little secret to you. This homemade recipe consists of none of the ingredients above. I simply replaced them with medjool dates, a bit of nut butter, and agave nectar. I managed to pull off making one of the best and healthiest caramel sauces I’ve ever tasted using these ingredients. This easy caramel sauce recipe only takes seconds to make and doesn’t require any heat whatsoever. You no longer have to worry about burnt sugar stuck your pan. If you want to indulge in one of the world’s many pleasures without the guilt, try out this quick caramel sauce recipe. Making caramel sauce doesn’t need to be intimidating nor unhealthy. Warm up the caramel sauce and drizzle some of it in your hot chocolate or serve it cool as a topping for your ice cream. Dip in some apples and bananas and you have a quick, healthy snack that will make you feel that you are exactly where you are supposed to be. Use it as fillings for pies, cakes, and cookies. Or you can eat it in spoonfuls by itself which I sometimes do. Combine all ingredients in a food processor or a high-powered blender. Process until very smooth. Store in an airtight container or in a jar in refrigerator for up to 10 days. This entry was posted in Gluten Free, Sauce, Vegetarian and tagged easy caramel sauce recipe, homemade caramel sauce, medjool dates, nut butter, quick caramel sauce, raw caramel sauce.